Democracy in Southeast Asia has been explained using a number of factors including historical legacies, social structures, developmental levels, transitional processes, and institutional designs while other elements, such as elite-level relations and social coalitions, have been overlooked. This book offers a new explanation for democracy’s collapse or persistence in Southeast Asia today. Focusing on Thailand, the Philippines and Indonesia — the three countries in the region with the most democratic experience — William Case shows that existing accounts based on contextual factors are by themselves incomplete. Hence, they lead us wrongly to anticipate democracy’s persistence in Thailand and its collapse in Indonesia. They more accurately, though only partially, correlate with democracy’s fluctuations in the Philippines. Advancing a new argument, Case shows that democracy’s fate is determined instead by the opportunities that contextual factors can provide for populist mobilization. His model enables us better to understand democracy’s breakdown in Thailand, its survival in Indonesia, and its slippage in the Philippines. Presenting research into vital questions over democratic durability and authoritarian backlash, this book will be of interest to scholars in the field of comparative politics, specifically comparative democratization and Southeast Asian politics. 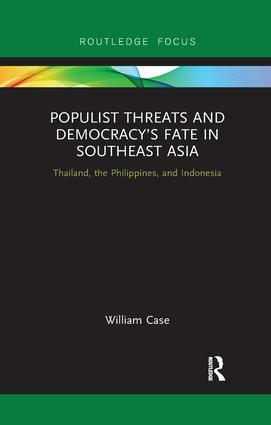 William Case is Professor in the Department of Asian and International Studies, City University of Hong Kong. His research interests are populism and political regimes in Southeast Asia, electoralism and the single-party dominance in Malaysia. His latest publication is the Routledge Handbook of Southeast Asian Democratization (2015) (ed).